Are you looking for contemporary office furniture that will give you the ability to meet all of the needs of your growing business? This typical offers you all of that, and so much more. Whether you are building out a new office space or giving a much needed overhaul to the office of one of your executives, this typical offers some key pieces that come together to give you everything that you need. 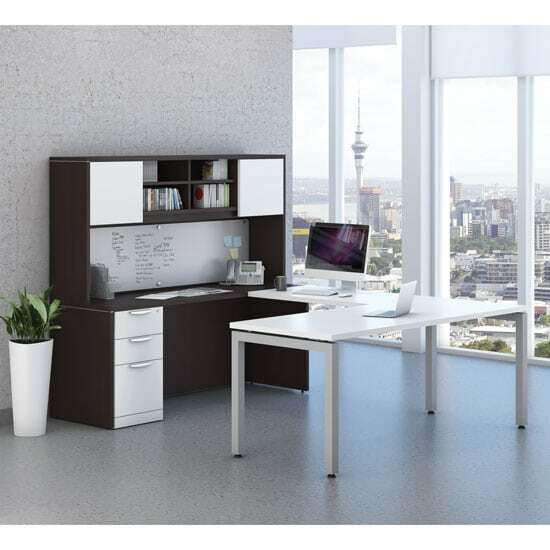 The desk supports and legs will ensure that your desk is sturdy, while the pedestal gives you all of the file storage space that is necessary for storing your important documentation. The open hutch gives you display and storage space, while also giving you great under-mounted lighting and a magnetic glass white board. This typical is perfect for the business or home office. This typical is available in eight beautiful finishes, so you can choose the one that best complements your office decor. Rich in styling and superior in construction, the Brooklyn Laminate Collection is an intelligent solution to any workstation need. Available in a wide range of components and sizes, it can be easily pieced together to create the configuration which best suits your needs. Attention to detail in design, quality of hardware and use of premium grade laminate work surfaces ensure years of trouble-free use.